Based on the conviction that only translators who write poetry themselves can properly recreate the celebrated and timeless tragedies of Aeschylus, Sophocles, and Euripides, the Greek Tragedy in New Translations series offers new translations that go beyond the literal meaning of the Greek in order to evoke the poetry of the originals. Under the general editorship of Peter Burian and Alan Shapiro, each volume includes a critical introduction, commentary on the text, full stage directions, and a glossary of the mythical and geographical references in the play.Although it has been at times overshadowed by his more famous Oedipus Tyrannus and Antigone, Sophocles' Electra is remarkable for its extreme emotions and taut drama.Electra recounts the murders of Clytemnestra and Aegisthus by Clytemnestra's son Orestes, to avenge their murder of his father Agamemnon, commander of the Greeks at Troy, upon his return home. Sophocles' version is presented from the viewpoint of Electra, Orestes' sister, who laments her father, bears witness to her mother's crime, and for years endures her mother's scorn. 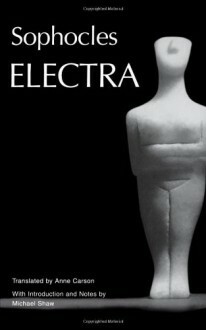 Despite her overwhelming passion for just revenge, Electra admits that her own actions are shameful. When Orestes arrives at last, her mood shifts from grief to joy, as Orestes carries out the bloody vengeance. Sophocles presents this story as a savage though necessary act of vengeance, vividly depicting Electra's grief, anger, and exultation. This translation equals the original in ferocity of expression, and leaves intact the inarticulate cries of suffering and joy that fill the play. More fun to act than to read, I think, but obviously, many people feel otherwise.